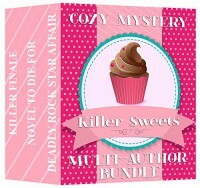 Cozy Mystery Multi-Author Bundle is a great set of cozy mysteries with characters you can't help but love. They each have women who decide to investigate murders when someone close to them is suspected of the murder. You can imagine the police actually investigating the murders are not very happy with them. This just adds to the humor in the stories. These authors are very illustrative writers who create an entire world for their audience to get lost in. The books are simultaneously exciting, suspenseful, and emotional. The stories in this bundle are great reads and definitely capture the reader in the story line. If you like murder mysteries I recommend the Cozy Mystery Multi-Author Bundle.